Buddy Blog! : Dig, Dug, Done! 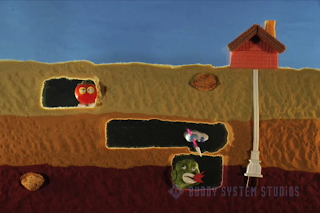 We just finished a PSA for 811- Call Before You Dig. This found-object adventure stars a peanut shaped Dig Dug who scurries around in the sand while trying to avoid vegetable monsters. Unfortunately, he forgets to call before he does it, and digs himself a fresh grave. Oh, and eat more vegetables kids!